Where will the Samurais come from? Many years back, in a moment of candor, one of the professors of my MBA course in UK expressed wistful regret that Great Britain never tried to replicate their experiment with a national civil service like the one they conducted in India - neither anywhere else in their vast colonies, nor back home. Years later, an officer of the US government familiar with India expressed almost similar sentiments. In this world where “professionalism” and “management” are revered words, those views of objective foreigners were rather thought provoking. The Government of India Act of 1858 created the Indian Civil Service. By 1934 the British were administering India through seven All India Services and five Central Services, together designated as Central Superior Services. The term “civil service” in India today loosely refers to the handful of services that provide senior managers for a wide array of the most critical government businesses ranging from general areas like administration to specialized fields like international relations, tax administration, law & order, audit and accounting, railways, posts etc. The rich history, the important role in managing affairs of the state and the prestige civil services carried made them the topmost career option for several decades after the independence. Working for the Government was working for the People of India. It gave tremendous satisfaction. Being a second generation civil servant, I grew up with the impression that general public respected government servants - from the postman and Railway Ticket Collector to officers of the elite civil services - perhaps because these people were considered as symbols of selfless public service. But things had started changing by the ‘80s. In 1989, when I informed some of my college teachers in Mumbai that I had cleared the civil service examination, one professor asked me coldly, “What’s so civil about the civil service?” I felt disappointment, disdain and derision in her tone. Most of my brighter classmates were taking their GRE or CAT and wanted to get away from India. At least in Mumbai, by that time, civil services were no longer a preferred option. With liberalization in the ‘90s the picture became worse. As private companies vied to attract better talent, the pay packages and perks became more and more lucrative. In metros, the lifestyle of my contemporaries in equivalent managerial positions in the corporate sector had become unachievable by civil servants. Having a father and an older sibling in civil service I was less naïve, but the visions that many batch-mates had of zipping across in government Ambassadors and living in sprawling bungalows were quickly shattered in the bigger cities. Only those posted in B or C class towns still enjoyed the “charm” of yellow PWD accommodation, a rundown office Gypsy and residential telephone. In my second year of posting in Delhi, a college friend who had taken the B-school route visited from Mumbai. He invited me over for lunch to his room in Le Meridian. He happily said the bill would be “adjusted” in his business account. He spoke enthusiastically of his company’s corporate values and clout. He proudly talked about how his company influenced government policies and decisions and how their MD aspired to build a new India. He also had a taxi waiting that dropped me back to my office. I didn’t have to hunt for an auto. I married a college mate who had become a journalist. Before marriage, a mutual friend advised her, “Ask him to change his job. It doesn't suit him. Government babus are horrible, paan-chewing creatures. Besides, how would you live in those filthy small towns?” It was a big shift from the times when civil servants were supposed to possess sophistication and intellectualism. OLQ – or Officer Like Quality was no longer at premium. Corporate Culture was the new benchmark of social grace. Already, a civil servant was not the best match for urban girls. Understandably therefore, I haven’t met a single boy or girl from any metro or even second tier towns in years who wanted to join the civil service. Neither the image, nor the salaries nor the prospects of constant transfers attracts them. The lure of cheap government guest houses on vacations or “tenure membership” of district sports clubs is no longer enough. Governance, like politics is considered a dirty job. Sometimes, the existing reality reminds me of the movie, The Last Samurai where a fast-westernising Japan has no place for the age old system of Samurais. Arrested for carrying arms into a meeting (a Samurai never left his sword behind), the leader of the Samurais, Katsumoto Moritsugu is ready to commit Seppuku (or hara-kiri). “The way of the Samurai is not necessary anymore”, he says. In India today, there is still – and I dare say even more - need for dynamic DMs, humane SPs, judicious DCs of taxation or polished First Secretaries in our embassies abroad. But the best are no longer looking at entering public service. Yet, as a nation we want the best, most professional, bright and sensitive civil servants. We want high class Samurais who will serve the nation with dedication, integrity and intelligence – sacrificing personal interests. At the least possible social remuneration. So it makes me wonder: Where will the Samurais come from? 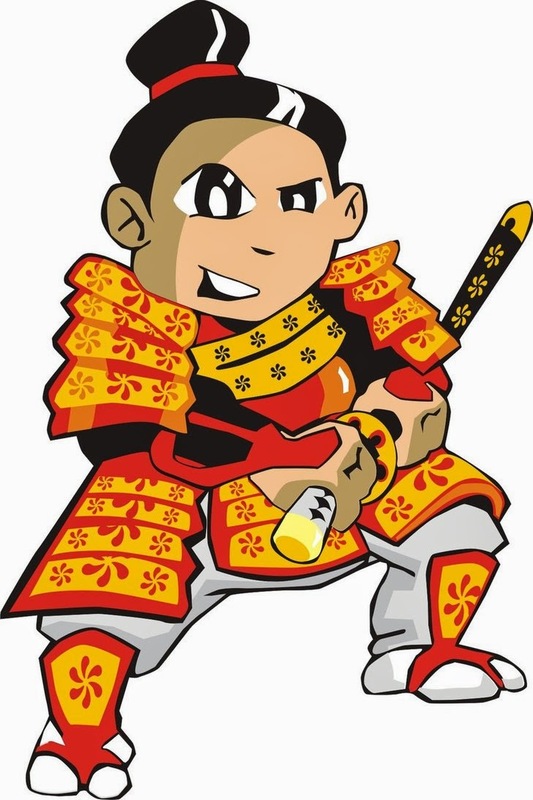 And more importantly – does India, as a nation even need those Samurai anymore? Or is it time to disband the old style bureaucracy and shift to a system where practically all functions of the state are privatized. Can’t this be done? Let’s examine four of the fundamental role of a state: defence, foreign relations, taxation and law & order. A famous and extremely popular author, in his book analysing the needs of present India makes a point of outsourcing LoC border defence to the US army. He reasons, this will be far cheaper than maintaining our own border security with, say, Pakistan because the US army already has bases in Pakistan and it would be in their interest to maintain safe borders between India and Pakistan. If I look at it like a rational, economic individual, it makes sense. At a fraction of the cost, our borders can be outsourced. Several small nations in Africa have already tried this successfully. Border security can be contracted out to another nation or mercenaries at a fraction of the cost (monetary or human) it takes to maintain a national army. Today, most public spaces – malls, cinemas, residential colonies, parks etc. have private security. Should not this model be extended to policing? Local communities can appoint their own policemen, private detective firms can be contracted to replace crime branch, mercenaries can be hired to conduct raids or replace armed constabulary. Instead of a dedicated, career diplomatic service, why can’t the job be done by hiring lobbyists, PR firms or contracting professionals on a tenure basis? Processing of visas or passport applications is already outsourced. Why can’t this philosophy be extended to other functions of our Ministry of External Affairs? Similarly, why can’t assessment and collection of federal taxes be given to firms of chartered accountants and auditors? Banks can be made responsible for collection – after all, we have all seen how active collection agents of banks are. Existing laws permit hiring of private auditors for very complex matters. Why not extend it to all tax cases? Such measures would practically eradicate the much-resented and redundant “government servants” from the structure of governance. This should come as a big relief and satisfaction to our citizens. And all this will substantially bring down the administrative costs that are the biggest portion of government spending. Service Level Agreements can be entered into so that the hired contractors simply deduct operational costs, charge a pre-decided contract fee and pay the balance to the government. They may even be allowed to raise public money through IPOs. So, if people do not want to continue with Arunachal border security – or it is a loss making enterprise, the share value of that company would fall and eventually it will cease to exist or amalgamate with some more efficient (profitable) company rendering defence services. If Indo-Pak relationship is becoming worse, the PR firm can be fired and a new one hired. If tax collections do not meet targets, the collection agency can be penalised and the contract withdrawn. The same for police service contractors. Why can’t all this be done? Such a course of action might make “government” itself redundant. If all its functions can be privatised/marketised and therefore outsourced, what will be the need for any “government”? Or this is all impractical and undesirable? If so, we come back to the need for having a dedicated band of Samurais – professional, ethical, intelligent, self-sacrificing, faceless and incorruptible. But how do we get them? That’s a thorn in my side. Yes, it does happen in India. 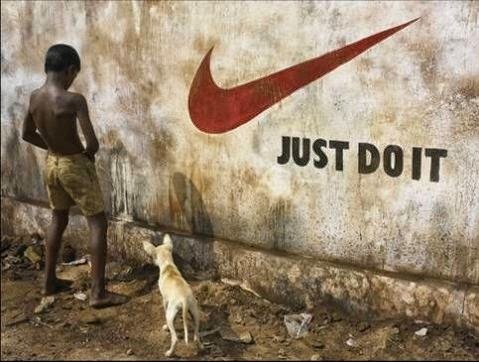 From open defecation on the side of roads, along railway tracks, urinating on walls and in public spaces - we do it in the open. It is a big problem. And the first cause of this problem is scarcity of toilets - both at homes and in public places. In India, a land of 1.27 billion people, nearly 19% of urban households have no toilet, according to the 2011 census. In rural areas, this figure is as high as 70% and open defecation is common practice. “At a rough estimate, we require at least 100 million household toilets in the country to prevent defecation in the open,” says Dr Bindeshwar Pathak, the founder of Sulabh, the affordable sanitation movement in India. But this is a huge number. Besides, we need to have at least 25% of that number to provide for need to answer the call of nature in public spaces like roadside, stations, market places etc. So we are looking at about 125 million toilet units. An estimate given in an article on the portal thethirdpole.net puts the cost of a Sulabh flush compost type costs between Rs 1500 - 55000. Let's take 1500 as the base price of one toilet for the 125 million required. It translates to Rs 187.5 billion or Rs 18750 crores. Assume it takes one man-day per day to keep them clean, and we are looking at 25 million public toilets. Floor level minimum wages in India are Rs. 115 per day. That's about Rs 2.8 billion per day or Rs 1022 billion per annum - or Rs 1.02 lakh crores per annum. And we are not yet counting repair and maintenance. India's defence budget for 2014-15 is Rs 2.24 lakh crores, which represents about 12% of total govt. expenditure - about 2.5% of GDP. The proposed cost on toilet maintenance (minus repairs) is almost half of the interim Defense budget. Can we afford all those toilets? At least not at one go. The second problem is of attitude. I remember, a few years back, Delhi's elite Khan Market (one of the most expensive commercial areas in the world) got 2 snazzy new public toilets. A newspaper carried a photo of a man urinating against the wall of the new toilet. When asked, the man simply replied - it costs 50 paise to drink a glass of water from the street vendor so why should it cost Rs 1 to take piss? Unbeatable logic! In India, small holy shrines of all religions come up almost spontaneously. Most are funded by locals through voluntary constributions. These small temples, crosses and mazaars are considered essential. Why can't we come together similarly and overcome the problem of generating resources for at least a few toilets locally? Is it because for us toilets are lower in priority than shrines? If (for whatever reason) local authorities are not providing enough toilets are we fine with peeing or crapping in the open? And why do we treat public toilets so shabbily? Just look at the way we use train loos - mess all over, wrappers and garbage in washbasins and on the floor. Just because it's someone else's responsibility to clean them? Hell - we have to keep the toilet mugs chained to the taps. Can't we at least keep the limited public toilets as clean as possible by taking extra care? If government doesn't wipe our bum, would we remain soiled? It's a thorn in my side. The photos above and below speak volumes. 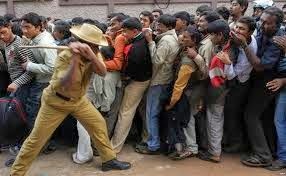 What is it with us Indians and queues? I remember Nagesh Kukunoor's Hyderabad Blues, where the hero, Varun returns to India from the US after a decade and is in for a culture shock. There's this scene where he is standing in a queue and the guy behind him keeps sticking to his bum in a most innocent yet disturbing manner. I'm sure we've all faced that situation - men and women. Then you have "innocent" queue jumpers - you've been waiting patiently in line and are keeping a healthy distance of a couple of feet from the person in front. A well-dressed (or poorly dressed) chap floats along, pauses innocuously next to you, then smoothly sidles into the line ahead of you. If you protest, he looks surprised and asks, "Oh! are you in this queue?" So what if there are also several people standing behind you and damn sure it is a goddamn queue. Some, more self-righteous jumpers may even tell you to mind your own business. A few may even attack you for interfering with their Fundamental Rights. Why do we do this? Is the Govt. to blame? Or politicians? Or some foreign hand? Then I recall an incident from a railway station some years back. I had gone to drop off someone. There was a huge queue for the unreserved compartments. The crowd was acting insane - pushing, shoving, screaming - mindless about women, aged and infants. 2 young RPF constables were standing by helplessly. Suddenly a graying and experienced Hawaldar came and started reprimanding the constables. "Why can't you control the crowd and get a queue formed?" The constables told him they had tried to talk to the crowd but no one was listening to them. The old Hawaldar said, "Why have you been given a cane? Use it!" They did. And the rowdy human mass metamorphosed into a sober queue almost instantly. The women and old folks even applauded. 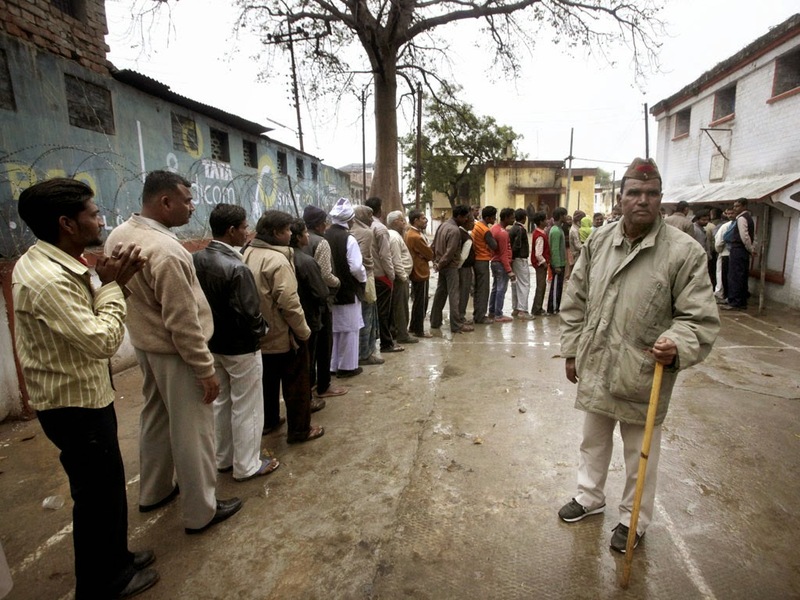 In India, queues seem to flow from the handle of the cane or the barrel of the gun. This utter disrespect for a queue is perhaps sign of a much bigger malady in India - lack of discipline and self-restraint. It is also a manifestation of our inner selfishness - that I and my urgency or comfort is above that of others. Me first and the rest be damned. So how do we tackle this? Notices and signboards don't seem to make any difference. And it is not only the uneducated or poor who break queues. Look at any airport or multiplex queue. It's not just men either. Very often, even young and fit girls would stride up straight to the counter - ignoring the queue. I've noticed men sending some woman from their group to bypass the queue. I'm not against the idea of a separate line for women and the elderly or differently abled. 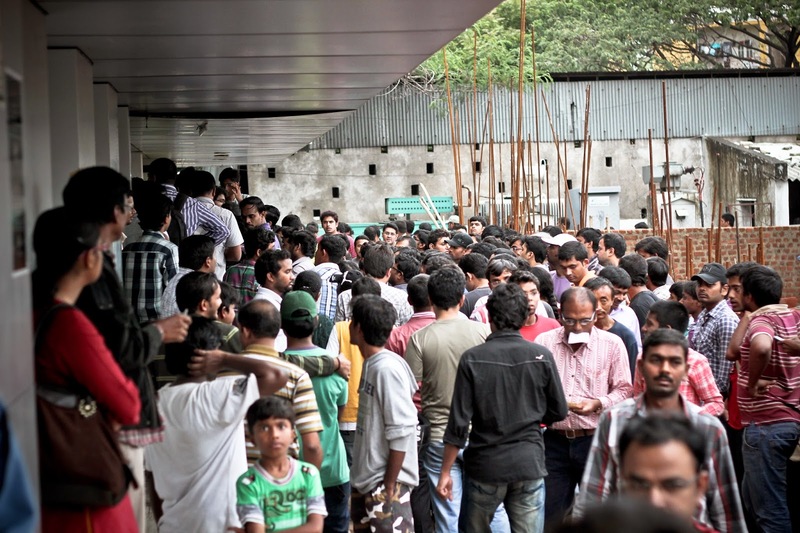 But where there is a common queue - like in a cinema hall, this is unethical. I feel this tendency of queue jumping is one of the seeds of corruption - and many other socio-economic problems - in India. VIP culture is a culture of me-first. Rules are bent when people want preferential school admission, train reservation, petrol pump allotment, spectrum allocation, mineral rights. We all want to jump some rightful queue and for that we find ample number of those in power to oblige -of course at a transaction cost. But coming back to the problem of queues, what do we do? The only thing I have seen actually work is the cane, the chain, the rope or the barricade. This is a thorn in my side.